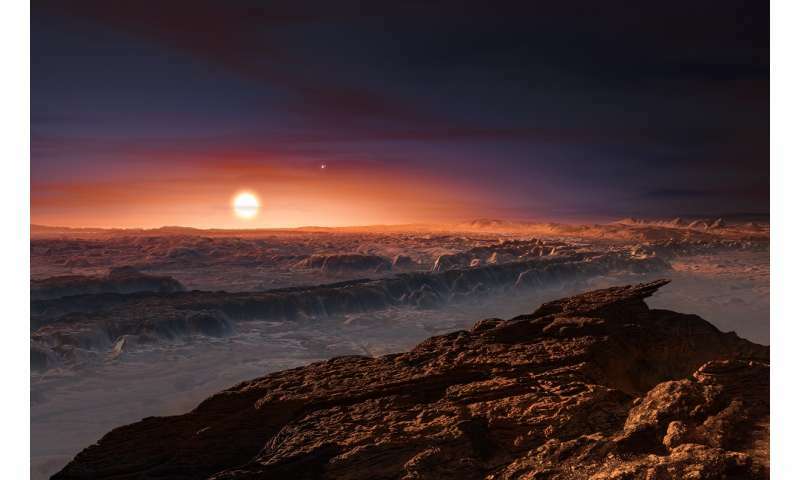 This artist's impression shows a view of the surface of the planet Proxima b orbiting the red dwarf star Proxima Centauri, the closest star to the Solar System. The double star Alpha Centauri AB also appears in the image to the upper-right of Proxima itself. Proxima b is a little more massive than the Earth and orbits in the habitable zone around Proxima Centauri, where the temperature is suitable for liquid water to exist on its surface. Credit: ESO/M. Kornmesser. 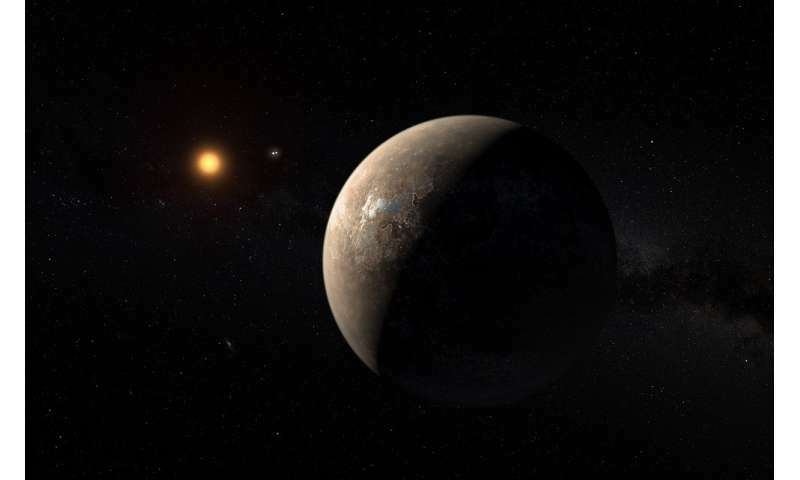 An international team of astronomers including Carnegie's Paul Butler has found clear evidence of a planet orbiting Proxima Centauri, the closest star to our Solar System. The new world, designated Proxima b, orbits its cool red parent star every 11 days and has a temperature suitable for liquid water to exist on its surface, if it were present. This rocky world is a little more massive than the Earth and is the closest exoplanet to us; it may even be the closest possible abode for life beyond our own Sun. A paper describing this milestone finding is published by Nature. Just over four light-years from our Solar System sits a red dwarf star named Proxima Centauri. This cool star in the constellation of Centaurus is too faint to be seen with the naked eye and is close to the much brighter pair of stars known as Alpha Centauri A and B. During the first half of 2016, the HARPS spectrograph on the European Southern Observatory's 3.6-meter telescope at La Silla regularly observed Proxima Centauri, as did other professional and amateur telescopes around the world. The team of astronomers, called the Pale Red Dot campaign, led by Carnegie alum Guillem Anglada-Escudé of Queen Mary, University of London was looking for a tiny back-and-forth wobble in the star caused by the gravitational pull of an orbiting planet. In addition to data gathered by the Pale Red Dot campaign, the paper incorporates contributions from scientists who have been observing Proxima Centauri for years, including Butler. As this was a topic with very wide public interest, the progress of the campaign between mid-January and April 2016 was shared publicly as it occurred on the Pale Red Dot website and via social media. Numerous outreach articles from specialists all around the world accompanied the reports on data collection. Anglada-Escudé explains the background to this unique search: "The first hints of a possible planet were spotted back in 2013, but the detection was not convincing. Since then we have worked hard to get further observations off the ground with help from ESO and others. The recent Pale Red Dot campaign has been about two years in the planning." The Pale Red Dot data, when combined with earlier observations, revealed a truly exciting result. At regular intervals, Proxima Centauri is approaching Earth at about 5 kilometers per hour—normal human walking pace—and at opposite times in those cycles it is receding at the same speed. This regular pattern repeats with a period of 11.2 days. Careful analysis of how tiny the resulting Doppler shifts were showed that they indicated the presence of a planet with a mass at least 1.3 times that of the Earth, orbiting about 7 million kilometers from Proxima Centauri—only 5 percent of the distance between the Earth and the Sun. An angular size comparison of how Proxima will appear in the sky seen from Proxima b, compared to how the Sun appears in our sky on Earth. Proxima is much smaller than the Sun, but Proxima b lies very close to its star. Credit: ESO/G. Coleman. One complication to the analysis is that red dwarfs like Proxima Centauri are active stars, and their natural brightness variations could mimic the presence of a planet. In order to exclude this possibility, the team also monitored the changing brightness of the star very carefully during the campaign using the ASH2 telescope at the San Pedro de Atacama Celestial Explorations Observatory in Chile and the Las Cumbres Observatory Global Telescope Network. Although the planet companion, Proxima b, orbits much closer to its star than Mercury does to the Sun in our Solar System, the star itself is far fainter and cooler than the Sun. As a result, Proxima b has an estimated temperature that—if water were present—would allow it in a liquid state on its surface, thus placing it within the so-called "habitable zone" around the star. Despite the temperate orbit of Proxima b, the conditions on the surface may be strongly affected by the ultraviolet and x-ray flares from the star—far more intense than the Earth experiences from the Sun. "The discovery of the potentially habitable planet around Proxima Cen is the culmination of 30 years of work that has improved stellar velocity measurement precision from 300 m/s to 1 m/s," Butler said. "This work has resulted in the discovery of hundreds of planets around the nearest stars, and now a potentially habitable planet around the nearest star in the sky. This work confirms the Kepler satellite and precision velocity studies that have shown that potentially habitable planets are common, and points the way to the future when such planets will be directly observed with giant ground- and space-based telescopes." We might have come from there. Barely made it. So, Forget Mars and Get to This! Fails to account for likely tidal locking and the relative youth of the star which, based on its type, is practically a newborn: 5b years out of 1+ trillion it would survive (were it not such close neighbors to a larger star which will die in a few billion years and probably destroy this planet). Young stars are violent, fluctuating wildly in their brightness and releasing massive amounts of radiation which would eliminate any atmosphere and liquid water long before life could form. Not to be a pessimist, but I'm not banking on Earth 2 being in our backyard. At regular intervals, Proxima Centauri is approaching Earth at about 5 kilometers per hour—normal human walking pace—and at opposite times in those cycles it is receding at the same speed. No. 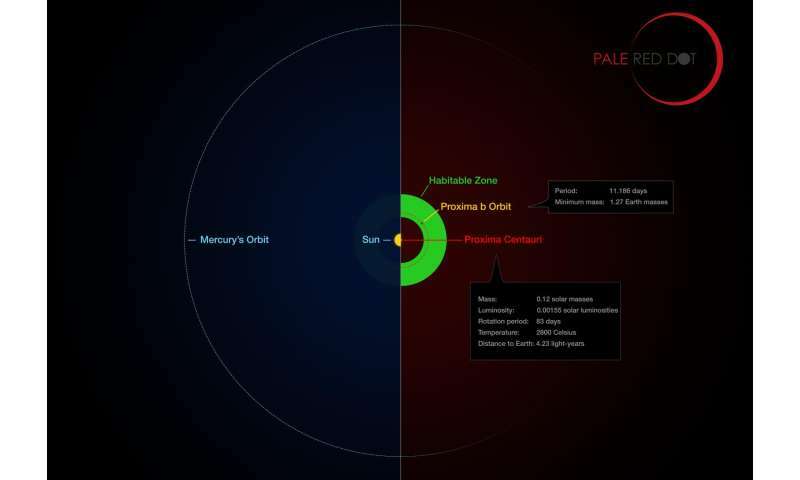 Proxima Centauri's radial velocity is −22.4 ± 0.5 km/s, i.e. it is moving away from us (technically the solar system's barycenter) at ~22.4 km/s. The planet is therefore causing the radial velocity to swing from 17 to 27 km/s away from us. TrollBane to aliens: "Can you here me now?" I suggest a compromise. The aliens and "Can you here me now?" not comment the each other and not evaluated. If you you do not give the attention the most alien will give up the of Comments, but will continue to monitor the site. I, as a an alien, I would rather give up the of Comments if it is provided that "Can you here me now?" classes free to comment. Without your of Comments is not interesting. I think this poster is inviting the aliens to visit him immediately in a language he is not yet proficient with. Perhaps they will deliver universal translators. We don't understand the life of a star. We are still using mc^2 as an energy equation. I know I'll get flap; but, I used to believe in Santa Clause, also. How to know whether it is Habitable for Organisms? Just Ship TODAY using the BEST AVAILABLE Tech VARIOUS Organisms! Just Hope for Hell With Them! I never realized there was a physics site for the criminally insane. Ha, welcome to the madness, I must confess to being puzzled as well as to how a respectable site such as this allows the most inane creationist trolling that one could hope to encounter.